Expert advice is one phone call away! 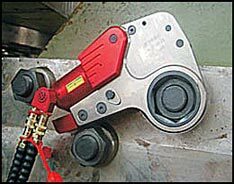 Low Clearance Hydraulic Wrench Series are perfect tools for limited access applications and long-bolt situations. With Torque coverage of 340 Nm. to 43,000 Nm. A complete high torque solution! Hydraulic Pumps & standard hoses. Torque Charts (Calibrated) are included. Hex Cassette Low Clearance Wrenches offer flexability and versatility - other Torque Wrenches types cannot. 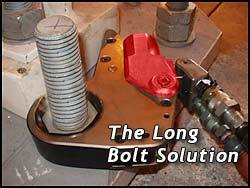 For Long Bolts: tighten down thread by-hand, place Hex hydraulic torque wrench over the bolt, onto the nut like a Ring Spanner, the hard work is the Hydraulics job, use the Reaction Pawl to release the pressure and remove Tool - easy! Deep sockets are not "deep" enough to do this, no wonder its called the Hydraulic Ring Spanner. Tightest Space around nut: when limited space means a nut is against a housing & a wrench + socket wont fit, the thin wall of the Hex Cassette Hydraulic Tool will fit where no other tool will! The Low Clearance Hex Cassette Hydrauliclow profile Multipier models gice many solutions for difficult flanges, heat exchangers & pressure pipes for the Petrochemical industry. 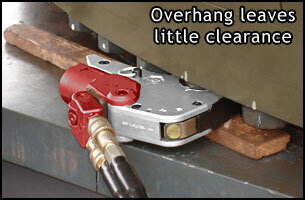 These tool with low clearance features solve access problems where no other tool is even close. Low Clearance Hex Cassette Hydraulic Tools are the low clearance tool of first choice: like a ring-spanner connected with Torque Multiplier, they have a similar nose radius to impact sockets. These access tools get torque to be the bolts thought impossible. Video of a Pipe Flange demonstrating a WREN Hex Cassette Low ClearanceTool. 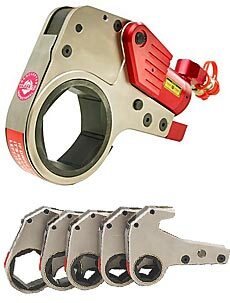 These Low Clearance Hydraulic Torque Wrench are also available for Hire. Hire solutions offer you the advantage of having the exact Tool needed for your application. If you already have a Pump & Hose then just Hire the right tool for your job. Tools are delivered Australia Wide. KLW-4000 Hydraulic Wrench Pumps are an industry basic for Hydraulic Wrench Tools. The Regulator varies from 1,500 - 10,000PSI to adjust the torque output. The auto-shift valve regulates the back stroke (Retract Side) to 1,500 PSI. 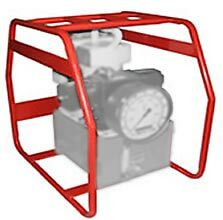 Supplied with simple chrome frame, Hose Couplers, oil & remote control with 4" Gauge. Pumps can also be Air Powered for when 240V is not available, the KLW-4000N pump gives the same full features but a Pneumatic motor power supply. Allow all equipment to remain together for transportation to the worksite. These Tough heavy duty plastic cases with lockable lids and 2 reinforced lift handles. 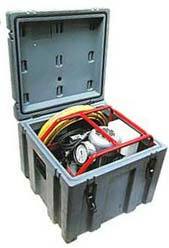 Most containers accommodate both pump, Tool, hose set and sockets . Each Low Clearance Hex-Cassette Hydraulic Tool has a nose radius that campares with impact sockets. Thus a small-radius ensures this tool easy access to tight applications ie under pipe flanges. 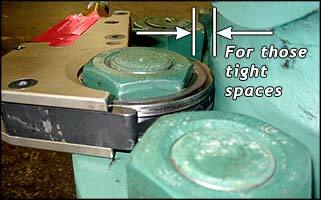 The "reducers" are fitted and secured with retainer rings if required. NOTE: When selecting a reducer, make sure your reduced " radius clearance" will still permit tool access. Remember that using an Reducer, you INCREASE the total nose radius, thus requiring MORE space so to fit the Hex Tool.